Evaluation: Zach is a pure scoring combo guard that is more comfortable off the ball where he can his jumper off by running off screens or using the pick and roll. Smooth shooter with a perfect release, good confidence, deep range, and the ability to contort his body to get off contested shots over bigger, more athletic, opponents. 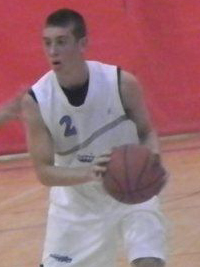 Capable ballhandler that can see the floor and get to the spots he needs to be, although he is not an elite playmaker. Can slash to the hoop and knows how to use the backboard to shield off shot-blockers and either score or get fouled. Bottom Line: Denny is an under the radar Division I or high Division II prospect that could become very good if he learns to be a PG. Confident competitor that can really shoot the ball and knows how to get his against better athletes he has a high ceiling to continue improving. Notes: Committed to Bowling Green in June after a great spring run with All Ohio Red.